We came upon Robert’s portfolio by way of Lenswork where he has supplied striking images as well as interesting essay thoughts on photography. Originally from the East Coast, but now of the West, he still carries that East Coast sensibility in his pictures. With decades of experience, he has been able to masterfully distill essentials of his subjects, often in abstract forms. 1. What do you want a viewer of your images to focus on while looking at your photographs? I hope that some of my own pure visual delight in the subject comes through, and that the image arrests the viewer’s attention and actively draws him or her into the moment. I think of my photographs as objects for contemplation, so my main intent is to focus the viewer, to shift his or her perception from the randomized chaos with which we are all surrounded and bombarded constantly, to enter a still, clear moment of reflection. 2. Your photos have a strong abstract element to them. How did you arrive at "seeing" the subject matter in this way? The best photographs to me always have a strong abstract foundation. This first came to me in studying the paintings of Paul Cezanne; in his work one can always sense the abstract “bones” of the image beneath the surface. (Same with Edward Weston’s work.) Without this dimension, an image may be lovely but lack an inner strength. I’ve always been thrilled, too, by the particular ability of the photographic medium to simultaneously convey both “reality” in the sense that the subject matter did indeed exist, and “abstraction” in the sense that it has been excerpted and isolated from the real world. 3. 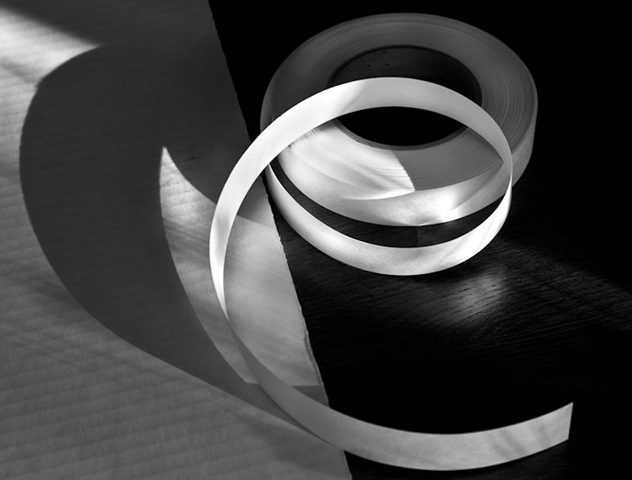 Light and shadow play a dominant role in many of your pieces … why? The dances of light and shadow are endlessly fascinating. Shadows add, both literally and figuratively, another dimension to a subject; they may echo the basic form and offer another compositional element. They also contribute to a sense of mystery, a very important element, I believe, in any photograph. Shadows, along with reflections, can bring a feeling of the surreal to an otherwise pedestrian subject. 4. What technical steps in your work typically contribute to a successful image? Coming originally from large and medium-format film work, there is ingrained in me the approach of pre-visualization at the time of shooting. I try to use the whole frame if possible, while staying open to discoveries during editing. I usually work for a full dynamic range, but I do not consider this to be an end in itself. The particular technical steps vary according to the needs of an image, and are of much less interest to me than my primary goal of whether the picture is conveying what I was seeing and feeling when shooting. Technically, I will do whatever I need to or can possibly think of to help an image come to life. 5. You work in video as well … what cross over elements influence your photography? The cross-over actually goes the other way for me. My photography work informs some of my video work, especially in the compositional sense. I am blessed to have a profession that has some significant creative aspects; as a writer-producer-director of educational video programs, I can become quite engaged in what I’m doing at a creative level. This, by the way, has only gotten more efficient in the digital world: those full-day darkroom opportunities were always challenging to arrange.